It's going down like a rodeo clown the week of July 10-16 in Fortuna. 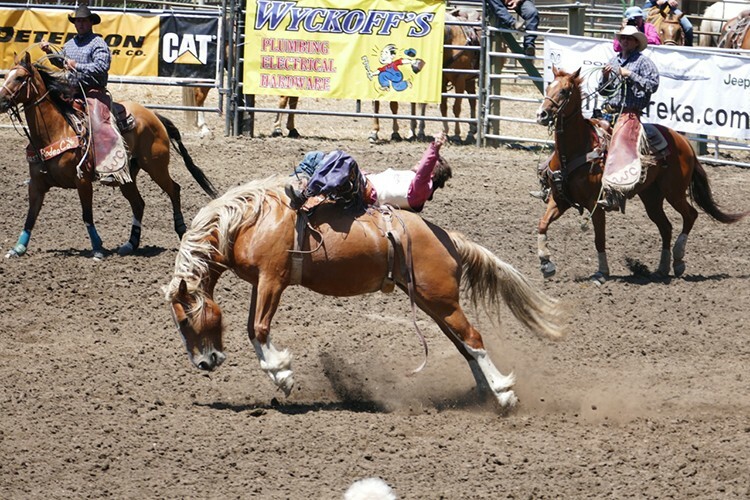 That's when the Fortuna Rodeo saddles up for the 96th time with a full week of family entertainment featuring bull and bronc riding, a barbecue, carnival, motorsports, parade, live music and more. The fun begins Monday with a chili cook-off and live music on Main Street starting at 5 p.m., and continues Tuesday with Children's Games at the Redwood Village Shopping Center from 6 p.m. to 8:30 p.m. (free) and a carnival coming to life Tuesday night at Rohner Park and continuing daily through Sunday, starting at noon each day ($25 all-day wristband). On Wednesday, catch the Junior Rodeo at 5 p.m. at the Rodeo Grounds (free) and Street Games at 6 p.m. on Main Street (free). Thursday's Junior Rodeo starts at 9 a.m., Fireman's Games on Main Street at 6:30 p.m. and Barrel Races in the evening at 7 p.m. On Friday, don't miss the popular Bullfighters Only Night — Rodeo Grounds gates open at 5 p.m. Quad Barrel Racing, Pickup Truck Pull and Quadiator action begins at 7 p.m. ($15). Saturday, enjoy a pancake breakfast at 7 a.m. at the Rohner Park Cook Shack ($6, $4), the parade down Main Street at noon and rodeo at 2 p.m. ($8, $5). In the evening, catch Bulls, Broncs, Bands & Brews at the Rodeo Grounds with music at 7 p.m. and bronc and bull riding at 8 p.m. ($10). Sunday there's the Fortuna Rodeo Run/Walk at 9 a.m. on Main Street followed by barbecue and live music at Rohner Park at 11 a.m. ($15). Rodeo action kicks up again at 1:30 p.m. ($8, $5). Mount up!